Be the King of the Mountain at High Hills Lodge. This luxury log cabin offers a great view and four bedrooms, two of which are master suites with king beds. The other two each have a queen bed. There are two living areas in the house, one on the main floor and the other in the basement. Both areas are equipped with a fireplace, televisions, and comfortable seating. High Hills Lodge is a great place for a family gathering, friends get together, or a small retreat for churches or business. Enjoy a nice fire on the screened in deck. High Hills Lodge is only about five minutes from Downtown Blue Ridge. Also, close to the cabin is horseback riding, white water rafting on the Ocoee River, site of the 1996 Olympics, and hiking trails. While at the cabin relax on the front porch and take in the incredible view across the Blue Ridge Mountains. High Hills Lodge is a great place in the mountains for your next getaway. 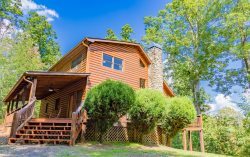 This Blue Ridge, Georgia Mountain Cabin Rental is located approximately 8-10 minutes from Downtown Blue Ridge, GA. The cabin is in the Aska Adventure Area, off of Aska Road, which is very close to the Rich Mountain Wilderness Area, USFS, Adventure Trail Rides for Horseback Riding, Blue Ridge Canopy Adventures, Toccoa River Adventures, Toccoa River Trout Fishing, The Toccoa Riverside Restaurant, Tubing, Benton McKaye Trail, Appalachian Trail, and Lake Blue Ridge. High Hills Lodge is private and is considered a secluded Blue Ridge Cabin Rental. Your staff is great very informative making sure we had everything needed for our stay in Blue Ridge. Your information on your website is very detailed, the pricing information is plain with no hidden fees. I liked the way you made sure I had all information through email and by phone. My family enjoyed their stay and we will be using your services in the future soon. The property was lovely there was more than enough room for 8 people, very open with the loft area. There were 2 living room areas which was awesome, there were a total of 3 fireplaces which was really nice. Also a jaccuzi tub in the main level bathroom which was really nice the huge Jacuzzi on the outside lower deck. This cabin has a beautiful layout, I love the huge wrap around porch. You can not really tell from the pictures but this cabin is very big and spacious. The BEST company to work with. We have stayed with other companies in the area and none compare to the service we received from Georgia Mountain Cabin Rentals. This property is amazing!! There isn't one thing I would change, cant wait to come back! they were wonderful, answered all my questions etc. Precious memories made. Much needed family time with our adult children and grandchildren. we all had a wonderful weekend and will make this an annual vacation. Very clean and beautiful property. Cant wait to come back!